Background: We noted a low reported prevalence of delirium (3%) in hospitalized older patients at a community teaching hospital in north central Wisconsin. Purpose: This was a quality improvement project to report recognition of delirium by nurses before and after an educational intervention. 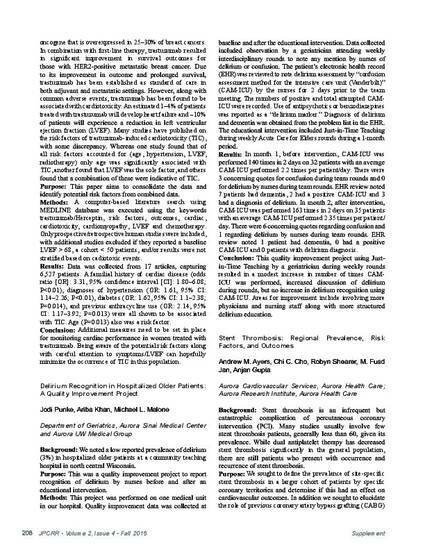 Methods: This project was performed on one medical unit in our hospital. Quality improvement data was collected at baseline and after the educational intervention. Data collected included observation by a geriatrician attending weekly interdisciplinary rounds to note any mention by nurses of delirium or confusion. The patient’s electronic health record (EHR) was reviewed to note delirium assessment by “confusion assessment method for the intensive care unit (Vanderbilt)” (CAM-ICU) by the nurses for 2 days prior to the team meeting. The numbers of positive and total attempted CAM-ICU were recorded. Use of antipsychotics or benzodiazepines was reported as a “delirium marker.” Diagnosis of delirium and dementia was obtained from the problem list in the EHR. The educational intervention included Just-in-Time Teaching during weekly Acute Care for Elders rounds during a 1-month period. Results: In month 1, before intervention, CAM-ICU was performed 140 times in 2 days on 32 patients with an average CAM-ICU performed 2.2 times per patient/day. There were 3 concerning quotes for confusion during team rounds and 0 for delirium by nurses during team rounds. EHR review noted 7 patients had dementia, 2 had a positive CAM-ICU and 3 had a diagnosis of delirium. In month 2, after intervention, CAM-ICU was performed 163 times in 2 days on 35 patients with an average CAM-ICU performed 2.35 times per patient/day. There were 6 concerning quotes regarding confusion and 1 regarding delirium by nurses during team rounds. EHR review noted 1 patient had dementia, 0 had a positive CAM-ICU and 0 patients with delirium diagnosis. Conclusion: This quality improvement project using Just-in-Time Teaching by a geriatrician during weekly rounds resulted in a modest increase in number of times CAM-ICU was performed, increased discussion of delirium during rounds, but no increase in delirium recognition using CAM-ICU. Areas for improvement include involving more physicians and nursing staff along with more structured delirium education.